When you install Flame-out, place 9credit on it. Use these credits to pay for using hosted program. 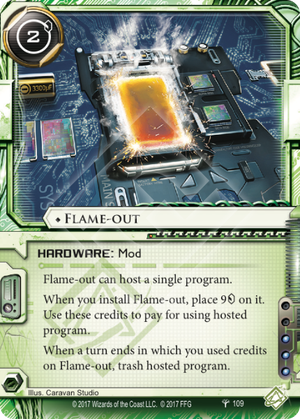 Can the Runner use credits hosted on Flame-out to pay the install cost from using Self-Modifying Code? No. Paying a program's install cost is not using that program, and Self-Modifying Code is no longer hosted on Flame-out when the program is being installed, so neither card can meet the requirements to use credits from Flame-out.